The pathogenesis of diabetes involves dysregulated gene expression on a pre- and posttranscriptional level. One key mechanism in the development and progression of diabetes is thought being a dysregulation of signalling mediators such as microRNAs. These microRNAs interfere with pathophysiological reactions in diabetes by affecting gene transcription, insulin resistance and endothelial dysfunction. Here, in this current issue, Stępień et al. analysed ectosomal miRNA patterns in patients with type 2 diabetes mellitus (T2DM) using different analytical techniques. The focus of the current analysis was to characterize pro- and anti-angiogenic signalling effects of ectosomal miRNAs revealing important pathophysiologic mechanisms and signalling in T2DM. The last decade has brought the rise of microvesicle research. Microvesicles that were originally thought to be waste, artefacts or fragments of dying cells came into the focus of biomedical researches worldwide. These vesicles have since been found to be a major pathway of communication between different cell types and not just a sign of distress or cell death [1, 2]. Almost all cell types shed extracellular vesicles either continuously or after stimulation. Previous studies that focused on microvesicles performed over a decade ago showed that both exo- and endosomes do contain microRNAs (miRNAs). A whole new field of research has developed over the last years and has determined microvesicles and miRNAs as mediators of cell-to-cell communication . miRNAs are short regulatory RNAs that can suppress the translation and stability of messenger RNAs (mRNA). miRNAs regulate the transcription and translation of several genes involved in cell metabolism and various canonical (and non-canonical) pathways in all living eukaryotic cells . Dysregulation of miRNA signalling is associated with the development of multiple diseases such as heart failure, oncogenesis and metabolic diseases. Many previous studies have suggested that miRNAs are major mediators in the pathogenesis of diabetes and its associated complications. These findings have ignited enthusiasm in biomedical researchers and have led to a plethora of publications focusing on miRNAs as possible biomarkers or on miRNA-based therapies. In the context of diabetes, it was found that alterations in miRNA signalling affect glucose homeostasis, insulin production and also cardiovascular complications. Diabetes mellitus type 2 (T2DM), as a complex, multi-systematic disease affects around 8% of the US population . 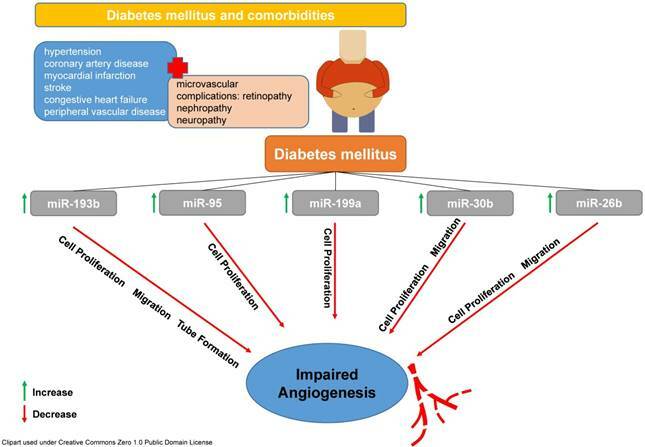 Most of the complications caused by diabetes mellitus are of vascular origin and induce microangiopathy leading to ischaemic heart disease, renal insufficiency, stroke and peripheral artery disease . Endothelial dysfunction is usually the first sign of beginning vascular complications associated with hyperglycaemia and diabetes mellitus . It was found that plasma levels of microvesicles are significantly higher in patients with diabetes mellitus compared to healthy controls . Moreover, the level of plasma microvesicles in patients suffering from diabetes and that do already have complications of the disease were considerably higher than in patients without complications . It was also found that hyperglycaemia inhibits cell cycle progression, which results in impaired endothelial cell proliferation and angiogenesis most likely via altering the expression of the c-kit (CD117) receptor, which is necessary for inducing endothelial progenitor cell migration and homing. More in-depth analyses have determined that a downregulation of miRNA expression (e.g. miR-221 and miR-222) was associated with such conditions [10, 11]. Moreover, adipose tissue acts as the place of origin for immunological and inflammatory processes interfering also with energy metabolism by releasing a broad spectrum of cellular mediators (such as cytokines, in this context adipokines). It was shown that apart from these signalling factors also the dysregulation of miRNA communication plays important roles in glucose and lipid metabolism and inflammatory reactions in diabetes. Multiple miRNAs and signalling systems and cascades have been shown to play an important role in the disease progression of T2DM (e.g PPARs, peroxisome proliferator activated receptors). Additionally, miRNAs such as miR-181a-5p, miR-132-3p, miR-199a-5p, miR-24-3p and miR-126-3p have been shown to mediate cellular glucose uptake and insulin sensitivity by interacting with the (phosphatidylinositol 3-kinase) PI3K, AKT and protein kinase C (PKC) signalling system . It has been shown that miRNAs interact with intracellular signalling pathways that are dysregulated such as the aforementioned in the development of T2DM and orchestrate cellular functions on multiple levels. In this present issue, Stępień et al. focused on ectosomes in patients with T2DM and sought to analyse ectosome-specific microRNAs. Their special emphasis lied on the pro- and anti-angiogenic potential of ectosomes and their contained miRNA. They have used different analytical approaches for the detection and in-depth analysis of ectosomes (atomic force microscopy, cryogenic transmission electron microscopy, and nanoparticle tracking). In a further step, they applied bioinformatics tools to interpret the data obtained for specific miRNA enrichment signatures in T2DM patients and found relevant differences that affect angiogenesis and vascularization. Amongst those differentially regulated miRNAs were miR-193b-3p, miR-199a-3p, miR-20a-3p, miR-26b-5p, miR-30b-5p, miR-30c-5p, miR-374a-5p, miR-409-3p and miR-95-3p, which evidenced relevant differences between ectosomes from T2DM patients and those from controls. These findings nicely correlate with results from previous studies mainly from the field of oncology and were corroborated by mechanistic in vitro analyses. Amongst others, miR26b, miR30b, miR95, miR193b and miR199a were increased in ectosomes from diabetic patients. All of these microRNAs have been shown to influence cell proliferation, migration and ultimately vessel formation und angiogenesis in a negative fashion as previous studies have determined (see Figure 1, [14-18]). T2DM is accompanied by different co-morbidities and most of them are mediated by microvascular complications. Amongst many others, miR-193b, miR-95, miR-199a, miR-30b and miR-26 are involved in pathophysiological reactions leading to a reduced cell proliferation, migration and formation of vascular tubes subsequently affecting angiogenesis in a negative fashion. These results indicate significant alterations in miRNA signalling and cell-to-cell communication in patients suffering from T2DM leading to impaired angiogenesis. Analyses like that are of utmost importance for deciphering a disease condition such as T2DM using new analytical tools and provide knowledge on signalling pathways in order to better understand the disease and hopefully might help to develop new treatment strategies. The ability of miRNAs to mediate intracellular signalling makes them a possible target for the development of new therapeutic concepts. Having knowledge on alterations of miRNA profiles in a specific disease will enable the development of therapeutic tools to modify the expression of certain miRNAs. This might lead to restoration of normal cell communication and function. However, the search for the message in a bottle in the vascular ocean has just begun.